The world is an angry place these days, it seems. The recent terror attacks in Paris, Istanbul, Ankara, Brussels, and elsewhere were augmented exactly one week ago by an Easter Sunday suicide bombing at a public park in Lahore, Pakistan. At press time, 69 Pakistanis have perished as a result of the bombing. The fact that this attack, which took place at Gulshan Iqbal Amusement Park, seemed to specifically target Christians, will no doubt increase the growing divide between those who believe that Islam remains a religion of peace and those who feel – rather more strongly, if you watch the evening news – that all Muslims pose a threat and that immigration should essentially be halted. I have never been to Pakistan, but I came within 23 kilometers of Lahore and literally gazed upon the country’s southern border. 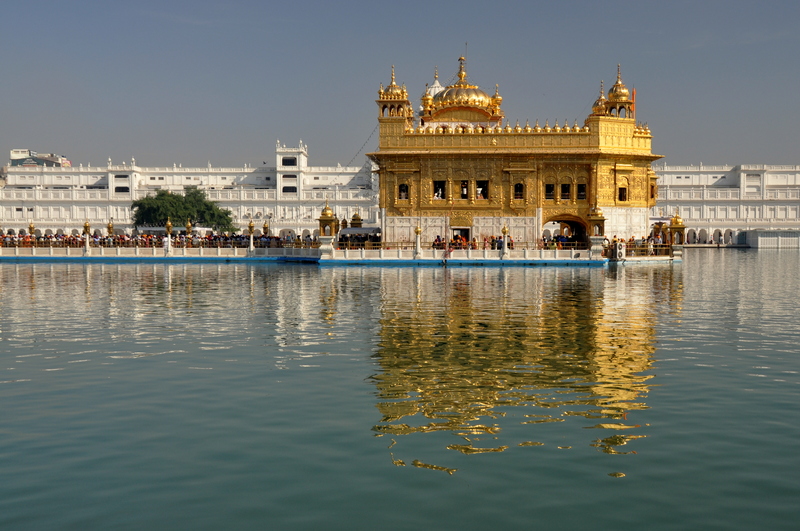 It was November, 2011 when I found myself in Amritsar, that glorious Sikh enclave and capital of India’s Punjab province. 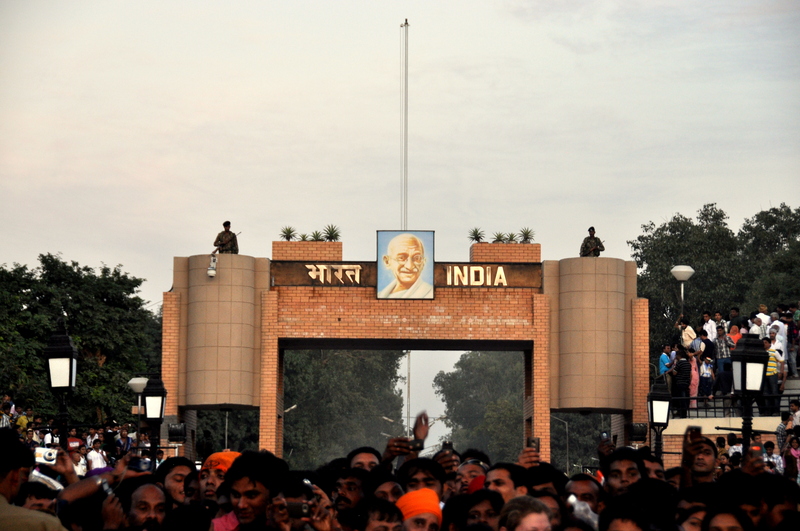 I had read that the thing to do for visitors to Amritsar (aside from visiting the city’s magnificent Golden Temple) was to take a van trip to the border of Attari, India and Wagah, Pakistan. My budget hotel in Amritsar, the Hotel Heritage Inn, signed me up for the day’s tour, and I was told to meet outside a different hotel later that afternoon. I struck up a conversation with a pair of foxy Slovenians while waiting for the van, which arrived late, as transport vessels have a tendency to do in India. We made it through Amritsar’s rush hour traffic without issue (no small feat, this), and the dense city was replaced by parched, dusty land. The border approached and the roadside was lined with refreshment kiosks held together by chicken wire and covered with corrugated metal. These stalls were not unlike the many that line major highways in Mexico, sub-Saharan Africa, and elsewhere. We parked at a large staging area, and I was required to check my daypack and bring just my camera and passport. 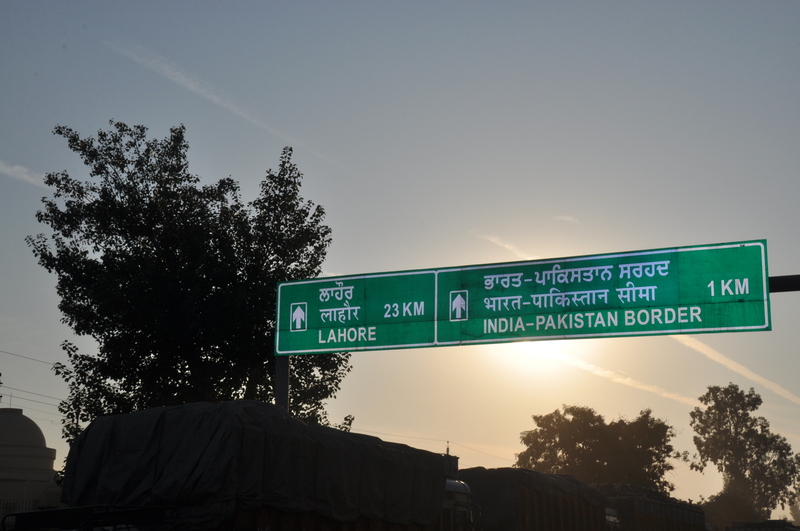 I followed the hordes in the direction of the India-Pakistan Border sign. The border crossing itself, like most others, was a sort of no man’s land, except this one was lined with bleachers and folding chairs. I snagged the last seat in the front row and looked to my left (west), where I could clearly see the Pakistan border sign, and a much smaller crowd of Pakistanis observing the festivities from their side. 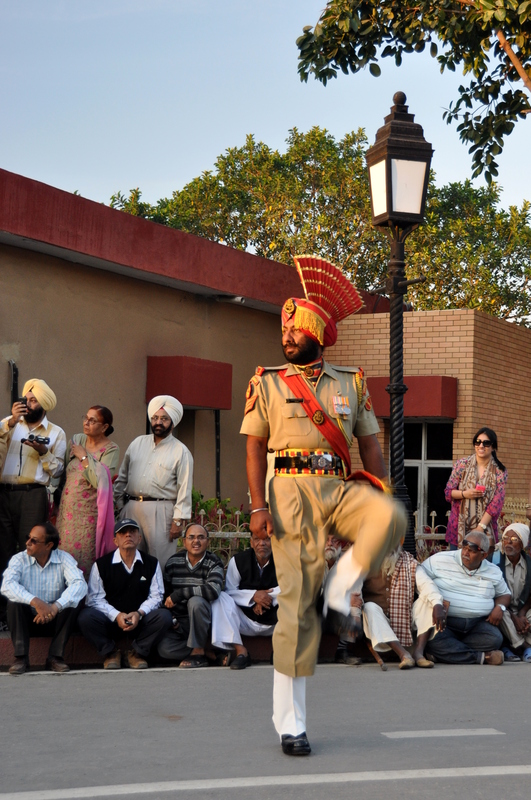 The nightly ceremony began with a series of army drill team-style marches, with the Indian border guards dressed in cooling beige and wearing fancy red hats, many of them with Sikh turbans beneath. The captain of the guards yelled out commands and goose-stepped rather spectacularly, raising his legs almost 180 degrees with each step! Although his expression was rather dour – like the face of a London Beefeater, perhaps – I saw through the veneer and knew that he was immensely proud. 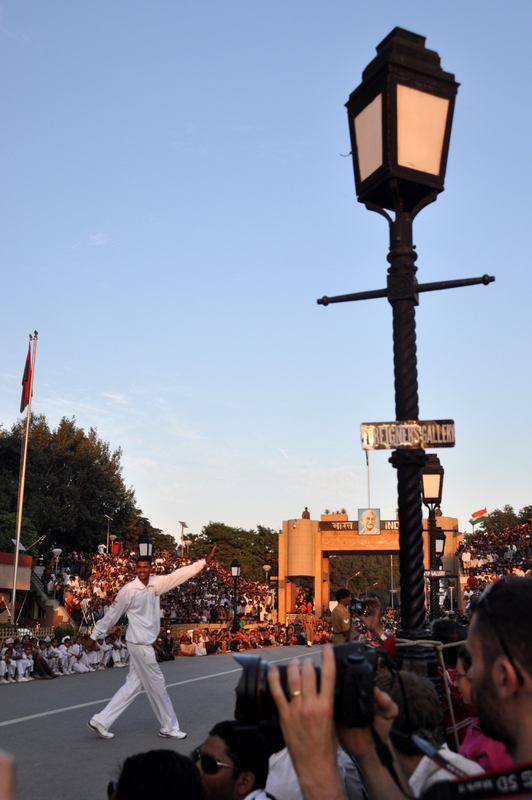 The emcee concluded his rally and focus returned to the border guards. They took turns sprinting towards the Pakistan gate. When they finished, each nation simultaneously lowered its flags, and guards from each side shook hands with guards from the other. A rope holding back spectators on the Indian side was lifted, and the ceremony was over for one more day. Crowds on the Indian side, easily several hundred-thick, slowly dispersed. Many gathered for photos with the Pakistan entrance behind them, while just as many greeted traveling family members who appeared to have just crossed the border in time, and lingered to watch the festive closing ritual. If you have ever witnessed family members separated by distance reunite at an international airport’s arrivals hall, you’ll know that scene of serenity and happiness…only this time it exists at one of the most volatile border crossings in the world! GringoPotpourri note: During my research for this blog entry, I learned that a suicide bomber detonated a 5 kg explosive in his vest on the Wagah side of the border one tragic evening in 2014, killing 60 Pakistani nationals. 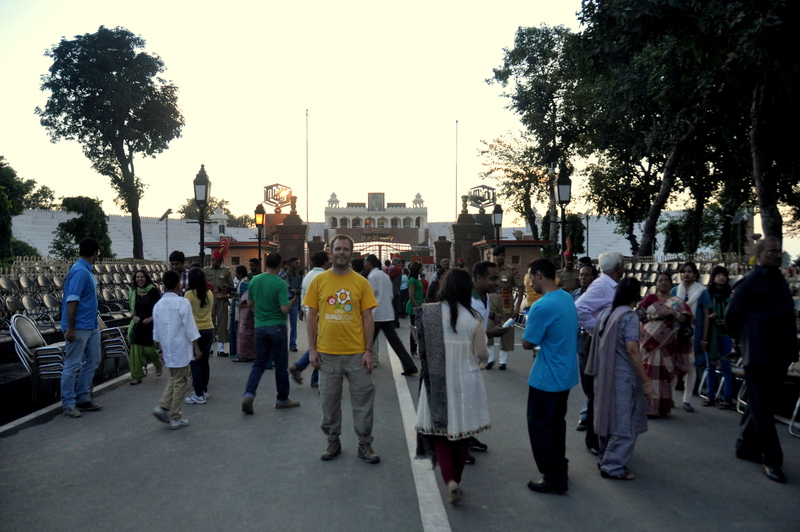 The Attari side of the Attari-Wagah border was the closest I have ever been to Pakistan. The 69-year-old nation, for two previous centuries a disenfranchised part of British India, has never been particularly high on my bucket list of countries to visit. I would like to think that this is simply because I don’t know much about Pakistan. I know that the country is home to K2, the world’s second-highest mountain, and to almost 200 million people, according to worldometers.info. 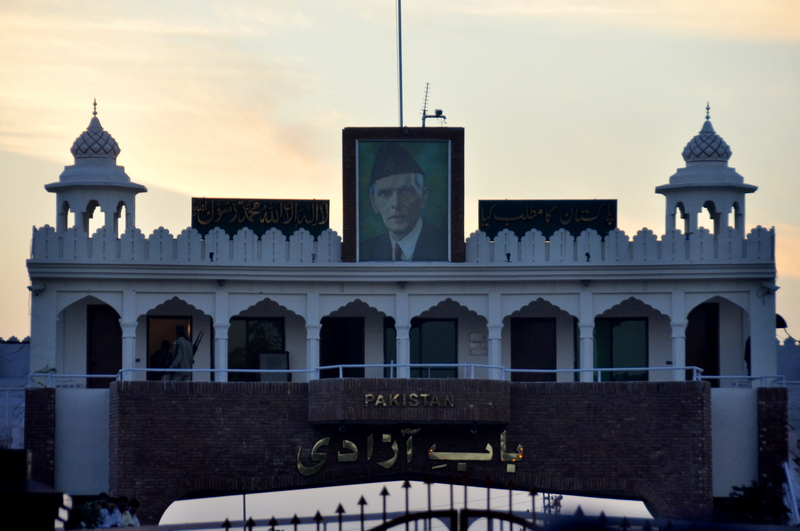 In addition to the Wagah side of the Attari-Wagah border, Pakistan also comprises one-half of the Khyber Pass, which connects Pakistan to Afghanistan and which, at present, may be the most dangerous border crossing in the world. This saddens me, for I know that the Khyber Pass is also one of the world’s great mountain roads – or would be, if not for bandits in the surrounding hills. Maybe one day. For I know that peace will eventually prevail.